Stuffed after a big meal? Swearing that you will never hog that much ever again? Most of us do that post indulging! Just yesterday after the grand Vishu feast, I told myself, tomorrow I am gonna eat light. So today was a soup and salad lunch for me. Spicy rasam for soup and crunchy carrot salad. My colleague at work shared this quick fix, yummy carrot salad recipe. Great tasting and easy to make. Hence had to share it with all of you. Wash, peel, and grate the carrot. Pour honey (If you are using sugar/jaggery, mix those with the grated carrot) and add lime juice. Add salt and mix well. In a small pan, heat the oil and put mustard seeds. When mustard seeds start crackling, add jeera. Add curry leaves to the oil. Add this seasoning to the salad and mix well. 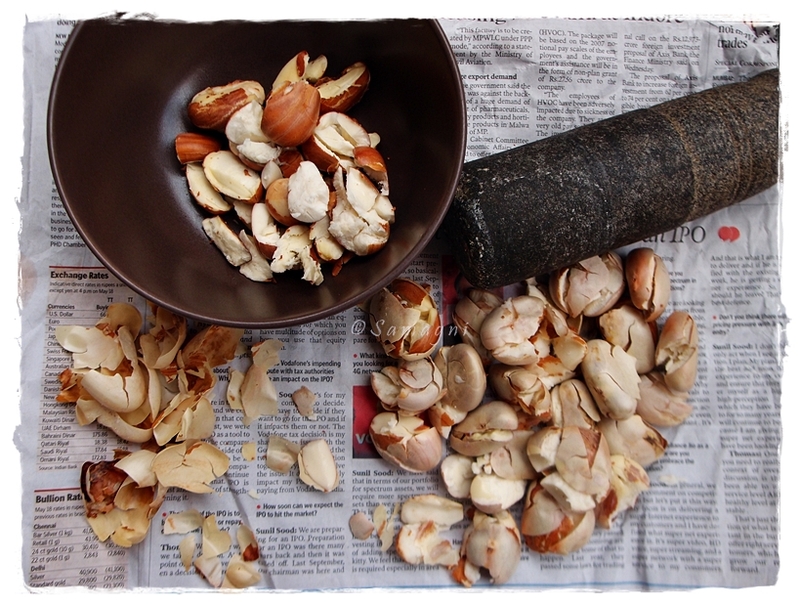 You could add almonds, peanuts, cashews, rasins, any of these as per your taste. Personally I prefer adding almonds that are soaked in water, peeled, and cut. Set aside for 5-10 mins to let the flavors blend. Crunchy munchy carrot salad is ready. Now is the season to buy radish and red carrots (carrots available through other seasons are orange). I love anything made of white radish. Mooli (radish) paratha is one of my favorites. I try to make radish subzi at least twice or thrice a month because of the immense health benefits it has. Here I will share two types of radish dry subzis that I prepare. Clean, peel, and cut the radishes into small pieces. If the radishes are fresh and come along with the stem and leaves, you can pluck the leaves and chop them and use it for the subzi. I like to retain the crunchy texture of the radish and hence cut them instead of grating them. However, if you prefer it grated, you could do so. Split the green chilies. Pour oil in a thick bottomed iron wok and turn on the heat. Add mustard seeds to the oil. When the mustard seeds start to splutter, add jeera and urad dal. If you add these along with the mustard seeds, they will get burnt. When dal turns pink in color, add curry leaves and split green chilies, and then add radish pieces. Stir and mix well. Add turmeric powder, close with a lid, and cook in medium flame for 5 mins. Stir occasionally. When the radishes become tender, turn off the fire and then add salt. Add grated coconut and mix well. Clean, peel, and grate the radishes. Clean, peel, and chop the onion finely. Split the green chilies. Pour oil in a thick bottomed iron wok and turn on the heat. Add mustard seeds to the oil. When they splutter, add curry leaves, green chilies, and finely chopped onion. Cook for 2-3 minutes until onion turns pink in color. Add grated radish. Mix well. Close with a lid and cook for 3-4 minutes stirring occasionally. When the radish becomes tender, turn off the fire, add salt, grated coconut and mix well. Serve along with rice or roti.